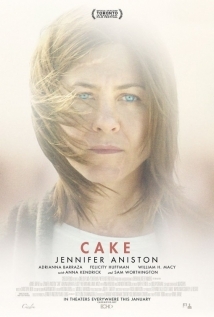 I think it is largely due to the praise being given to Jennifer Aniston for her role in this film that made me not entirely impressed with the film. Don’t get me wrong, I have always enjoyed Jennifer Aniston. So with all the critical acclaim for this role, my expectations were incredibly high. But when I was finally able to watch the film, I was left feeling underwhelmed. It was still a good performance, but not awe-inspiring, in my opinion. To me, Adriana Barraza gave the best performance in the film. The writing was pretty decent, but I feel like they were trying way too hard to evoke sadness and a sense of loss. I will say that Patrick Tobin excelled where so many others have failed. He managed to avoid the exposition while still giving us the information that we needed to know in order to understand the story. And for that, I commend him. Bravo, Mr. Tobin, bravo. This is one of the few “in-the-spotlight” films this year whose story is about a woman. Most of them, I’ve noticed, and certainly all the ones up for Best Picture, are about men. So I give it a 6 in diversity, because there are several women in the film, and only one man who is in more than one scene. Also, the only time any two women discuss a man is when Jennifer Aniston is hallucinating the ghost Anna Kendrick, and really that’s just her talking to herself. I would give the film a higher rating in diversity had the only POC in the film, and the character with the second-most screen time, NOT been a housekeeper. A Mexican housekeeper. Surprise! The cinematography was really very good. Here is another aspect of the film that was trying way too hard to evoke sadness and loss into the hearts of the audience. The scars on Jennifer Aniston’s body and face were excellent. They were emphasized enough to be noticeable but subtle enough so as not to be a distraction from the story. This really is a very good story. It’s about a woman who deals with prescription drug addiction to abate her chronic pain and to numb the heartbreak of the loss of her son. I think the film deals grief in a real way, even if they are trying too hard to make us sad. It was a little slow in parts, perhaps a little too long. Points are being taken for how much it tried too hard.